Jonathan Wright started studying violin at the age of 5 and has spent over 25 years teaching and performing. An active performer, he has played with the Orchestras of Macon, Valdosta, Columbus, Charleston, Atlanta, Hilton Head, and Savannah, among others. 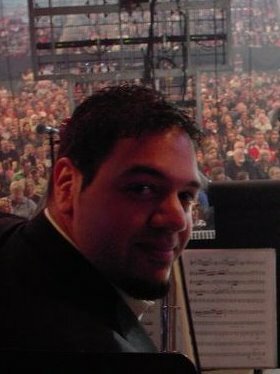 In addition to orchestral work, he has had the opportunity to perform with artists like Christina Aguilera, Phil Collins, Sarah McLaughlin, Josh Groban, The Trans-Siberian Orchestra, to name a few. Mr. Wright has been on over 25 domestic and international tours as a principal violinist and contractor, most recently, a month long tour in Japan. In June of 2015, he took a position as agent/manager with OmniPops Entertainment. As a teacher, he has maintained an active teaching studio since 2000. A number of his students have gone on to pursue careers in music in the fields of performance, education, and therapy. He is also a frequent guest clinician for the Cobb, Cherokee, Gwinnett, and Fulton County school systems. An adventurous flutist hailed for her "versatility and depth of understanding" (Composer Eva Kendrick), Dr. Jessica Sherer currently serves as principal flutist with Sinfonia Gulf Coast, piccoloist with the Albany Symphony, assistant principal flutist with the LaGrange Symphony, and performs regularly with orchestras throughout the Southeast, including the Atlanta Opera Orchestra, Greenville Symphony, South Carolina Philharmonic, Spartanburg Philharmonic, Symphony Orchestra Augusta, and the Orlando Philharmonic. She has also shared the stage with such artists as Sarah McLachlan, Dame Evelyn Glennie, and Kristin Chenoweth. Jessica is co-founder of Anon Ensemble, a flute, viola, and bassoon trio whose commissioned work, Juntos, by Eva Kendrick, was recently awared the Judith Lang Zaimont Prize for the International Alliance of Women in Music New Music Search. She is also a member of Atlanta’s acclaimed new music ensemble, Chamber Cartel. Jessica serves on the faculty of Agnes Scott College and maintains a large and selective private studio, where her students regularly win competition prizes and positions in prominent youth orchestras and All-State ensembles. A long time advocate of social change through music, Jessica served as the Flute Teaching Artist for the Atlanta Music Project, an El Sistema organization providing intensive musical training for children in underserved communities, from its inception in 2010 until 2015. She was a speaker at the 2012 TEDx Centennial Park Women conference on the topic of social change through music, and has recently launched Play It Forward, which provides private lesson scholarships for financially disadvantaged students in exchange for hour-for-hour volunteer work. In addition to ACMF, Jessica spends her summers as an Artist in Residence at the Orfeo Music Festival in Vipiteno, Italy. Jessica holds a D.M. from Florida State University, a M.M. from the Longy School of Music, and a B.M. from Boston University, and has studied at the Brevard and Bowdoin music festivals. Her principal teachers include Robert Willoughby, Eva Amsler, Laura Gilbert, Marianne Gedigian, Linda Toote, and Elizabeth Goode. She can be heard on recordings with the FSU Symphony Orchestra (Naxos) and Chamber Cartel (independent).